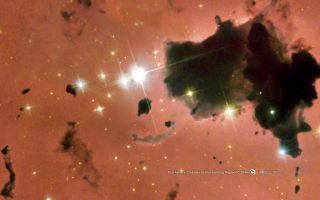 Dark clouds of dust, called globules, are silhouetted against nearby, bright stars. Little is known about the globules, except that they are generally associated with areas of star formation. Dark clouds of dust, called globules, are silhouetted against nearby, bright stars in this space wallpaper. Little is known about the globules, except that they are generally associated with areas of star formation.